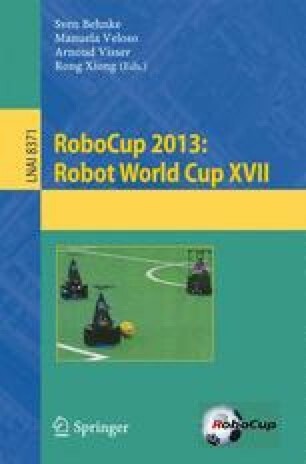 In RoboCup Middle Size league (MSL) the main referee uses assisting technology, controlled by a second referee, to support him, in particular for conveying referee decisions for robot players with the help of a wireless communication system. In this paper a vision-based system is introduced, able to interpret dynamic and static gestures of the referee, thus eliminating the need for a second one. The referee’s gestures are interpreted by the system and sent directly to the Referee Box, which sends the proper commands to the robots. The system is divided into four modules: a real time hand tracking and feature extraction, a SVM (Support Vector Machine) for static hand posture identification, an HMM (Hidden Markov Model) for dynamic unistroke hand gesture recognition, and a FSM (Finite State Machine) to control the various system states transitions. The experimental results showed that the system works very reliably, being able to recognize the combination of gestures and hand postures in real-time. For the hand posture recognition, with the SVM model trained with the selected features, an accuracy of 98,2% was achieved. Also, the system has many advantages over the current implemented one, like avoiding the necessity of a second referee, working on noisy environments, working on wireless jammed situations. This system is easy to implement and train and may be an inexpensive solution.